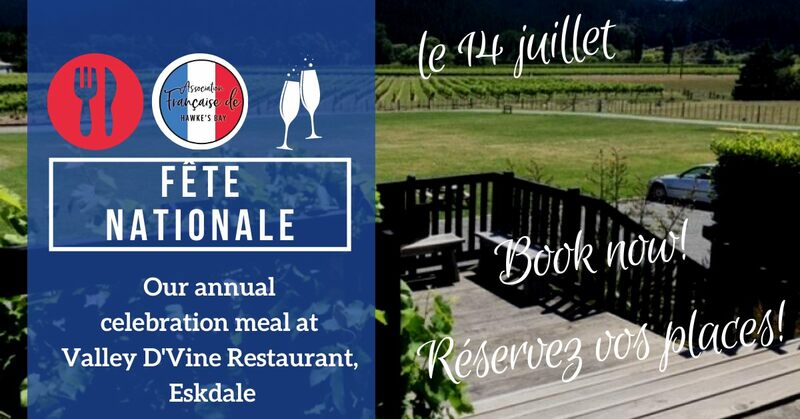 About: For the last five years the Association Française de Hawke's Bay has celebrated Bastille Day in Hawke's Bay. ​Venues have included: St George's Winery, Speights Ale House, Creative Arts, 1024, Clive Hotel, The Factory and the Emporium. The event has usually been at night time and includes an apéro, a three course meal and forms of entertainment, including: a speech and toast, quizes, singing, music and art. We have arranged for the room upstairs which has a lovely view over the inner fishing harbour in Napier. There will be a three course dinner including a vegetarian option. Theme: It's Winter Deco Weekend, so you can dress up Art Deco too. The Hawke's Bay French Association combined with Travelsmart Napier for the opening of La Belle France, a photographic exhibition by Greg Thompson. 5:00-7:00pm on Thursday 14 July and wine was supplied by Ngatarawa Wines and was booked out. Please note the exhibition will continue until 21st July between 10am-4pm and is an exhibition of photos in France. Photos courtesy of Andrew Caldwell.